A few years ago a cousin discovered this photograph in a trunk full of Luján family historical records. On the back it was identified only as “Luján family.” Of course the next question was: Which Luján family? There were lots to pick from! 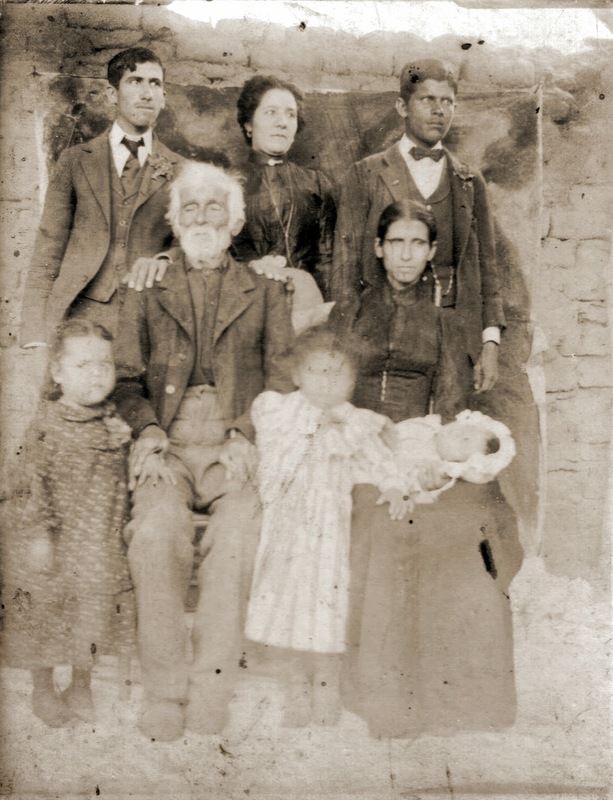 I had a theory it was the family of Jesús Luján (1811-1871) of San Elizario, my 3x great grandfather, and his family, which would include my 2x great grandfather Juan María Luján (1835-1914). But for that theory to work it would have to date from around 1860-1870. The faces of the two young men strongly resembled other photos of Juan María and his brother José Mauro, so that seemed to argue in favor of my hypothesis. The adobe house in the background looked like the adobe house Jesús had build around 1850 on the plaza of San Elizario. But I wondered if the clothing was right for that time period. Previously I had engaged the services of Jayne Shrimpton, an expert in the dating of photographs based on the fashions depicted in them. So I turned to her again to test my hypothesis. Sadly, Jayne’s analysis dates the photo too late to prove my hypothesis. So these folks are still mi familia, but I don’t know the exact relationship… Yet! We only have the visual image to work from here and as the photograph is set outdoors, I am not quite sure whether it was taken by a professional photographer. This does seem likely however, as a sheet has been pinned up on the rough brick wall behind the group, to produce a plain backdrop and perhaps suggest a more genteel interior setting; also these ancestors have clearly dressed up in good clothing for the occasion. Some are looking to our right, others straight ahead, and one little girl has moved during the exposure, which looks rather amusing but reflects the difficulty that some photographers experienced in capturing groups of people of different ages. In a mixed group scene like this we usually focus on the younger female adults, whose appearance generally provides the most reliable idea of the date. Here are two women, both of whom are partially obscured, but whose attire suggests a date close to 1900 – c.1899-1904, the most likely years 1900-03. Key features in support of this time frame are their formal dark bodices with high necklines and narrow sleeves with slight puffing around the shoulder. They wear fashionable watch or scent bottle chains suspended on their bodices and one wears a good brooch: she looks more stylish than the seated lady who seems to be busy with young children to look after. It isn’t possible to date the men and children quite so precisely as the women, but the two small girls at the front wear the loose smock frocks fashionable between the mid-1890s and at least 1910. The men wear smart three-piece suits, although the man on the right may have borrowed his jacket as the sleeves are very short. Their shirt collars are the starched turned-down variety characteristic of the turn of the 20th century and the younger men are more or less clean shaven in the ‘modern’ fashion. There appear to be about three generations of the family represented here, the two most senior or important people in the group seated. The elderly man aged in his 70s or older is presumably the head of the family. I see no lady here likely to be his wife, so probably he is a widower – unless by chance he was married to the much younger woman sitting next to him. She seems to be the mother of the children – two girls aged about 4 to 6 years old and the baby, of uncertain gender. We can only guess at the relationship of these figures to the three adults standing at the back: is one of the men the husband of the seated lady, or are they all her siblings and the four of them the children of the elderly man? Hopefully the firm time frame will give you some clues as to the possible identities of these ancestors. Lyza knows who all these people are….